Amy Petty's Inspiring Story - Terry Peloton. This is someone I am very lucky to call a friend, Amy Petty. I met her last year on a group bike ride in Oklahoma City. I fell in behind her and immediately could tell that she once had considerable weight, judging from the excess skin on her legs and arms. I didn’t know her name yet, but I was curious. I ended up speaking to another woman that night, who is one of Amy’s coworkers. I found out she is a survivor of the Oklahoma City Bombing. I was even more curious after that, thinking perhaps she had gained weight after the fact from depression or being bedridden from an injury. The next week during the group ride I made some small talk, which didn’t last long, before we hit 5 miles she was trying to convince me to do a charity ride the next weekend and join her for her first triathlon… in 3 weeks. “I can’t swim either, I just started lessons this week.” She said. By the end of the month, I learned she was 350 pounds when she was buried for over 6 hours, her leg pinned beneath 10 feet of rubble. The remarkable scar on her leg makes it unbelievable she has no permanent injury. She speaks publicly every month, many times, about being a survivor. This last month her hour-long speech was delivered from a stationary bike. An idea she was so excited about she couldn’t contain herself. I found myself joining spin classes in December for her prep. It was all she talked about, she would speak about taking on life challenges like a hill climb and she hoped people would be inspired by her love of the bike. While over all nutrition and fitness has made a difference in her physical appearance. The bike has given her such joy. It has been a great source of happiness for her and she strives to share that gift with others. She recently invited an overweight woman to join a group ride. Amy’s joy was contagious; I’ve seen this new woman on two more group rides grinning ear to ear. Amy has an awesome story. 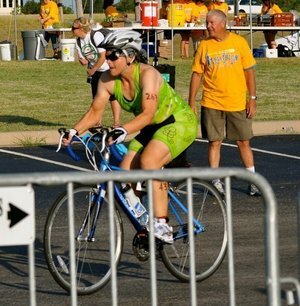 She biked across the state, she completed two sprint triathlons, a half marathon, and she bikes to work daily during the spring, summer and fall. She advocates for cyclists, having a close relationship some state government officials, most recently involving a very important bike route bridge that is being resurfaced. If there was ever a woman worthy of recognition for her efforts in cycling, you couldn’t find a better candidate than Amy Petty. Congratulations, Amy, from all of us at Terry! I think she is just awesome. What an inspiration. I too love my bike at 70 years old. It makes me feel young and inspires others to get up and ride. Amy sounds like a woman I would like to know and emulate. I will keep her in mind when I feel like complaining about petty annoyances in my life. Thanks so much for sharing her story. What a great story. I too would love to meet Amy and hear her story! I took up cycling just about a year ago after being invited to a women’s mountain biking clinic. I didn’t even own a bike when I agreed to go to the clinic. I soon purchased one and started riding every day mainly so I wouldn’t embarrass myself at the clinic by being winded after five minutes. I had no idea that cycling would be a form of exercise that I would truly enjoy. Late last summer (after the mountain biking clinic), I bought my second bike (a road bike). Any day I can ride is a great day. Through cycling, I have met a great community of people and have been able to maintain my 80 pound weight loss. Cycling is the best thing I have done for myself (besides the weight loss) in YEARS! Way to go Amy!!! You really are an inspiration to us all! See you in a couple of weeks at OKFW and again in August for HHH! Lady…YOU ROCK! Congratulations Amy, i am proud to have read your story and know you will have a good bike to ride for your next challenge. What an awsome story! will be with me forever. With our without the bike, Amy is truly worthy of many accolades. Congratulations, Amy! You are more than deserving and a role model for all of us. Wooo hooo! Amy, I am so glad for your winning. See you Saturday, on the FreeWheel training ride. This is truly an extraordinary story and inspiration on so many levels. As someone who was once over 80 pounds over-weight for my 5 foot 4 frame, I can identify with that part of Amy’s story. As for her transformation, her ordeal in the Oklahoma bombing and her determination that she has AND Shares and spreads to others – that’s real guts and glory. Amy, and her friend should be proud of this accomplishment. Thank you for sharing her story. What an amazing story! Her enthusiasm for bike riding is contagious. Thank you for sharing her story.